Bazaar - Friday 1st & Saturday 2nd December: We had a good meeting on Tuesday, but we need your help to make the bazaar a big success. Donations of Tea bags/Instant Coffee/Squash. Each year our refreshment room and bistro need these necessary supplies. However buying these items from cash-and-carry is a bit excessive (1000 tea bags and 1kg of coffee) so this year we are asking for donations of these small incidentals. Youth Club – Sundays 4.30-6pm: (please note the change of time for the winter!) The Youth Club is for anyone aged 10-15 years. Please bring any board games you could donate to the Parish Youth Club. Readers: We haven’t forgotten you!! Dates to be arranged soon. APF 'Red' Boxes: Thank you to everyone who have returned their red box for counting. Once they have been emptied and counted, the box will be left on the table in the porch – keep a lookout for yours. Good Counsel 'Blue' boxes: It has been a while since these have been counted too. If you have a full one, please bring it in and we will count it for you and send the money off to Good Counsel. If you would like your box back, please put a note with your name and attach to the box. Handy Man needed: for the Parish & Presbytery. See fr CB. Congratulations to St Bede's School on their recent OFSTED inspection. In his report the inspector acknowledged that “all the children make good or better than good progress by the time they leave the school.” Well done to Mrs Ostrynska, all the teachers, support staff (in the classrooms, office and Martin too) and pupils who work so hard throughout the year. Welcome to God's Church: Rosabelle Maria Merighi, daughter of Catarina baptised by Fr Michael Rowe in October and Ciara Anne Murphy-O’Connor, daughter of James & Susan baptised by Fr Przemek at the beginning of November. The Laurels School is delighted to announce new entry points of 13+ and Sixth Form with applications now being accepted for both in-year admissions as well as September 2018. 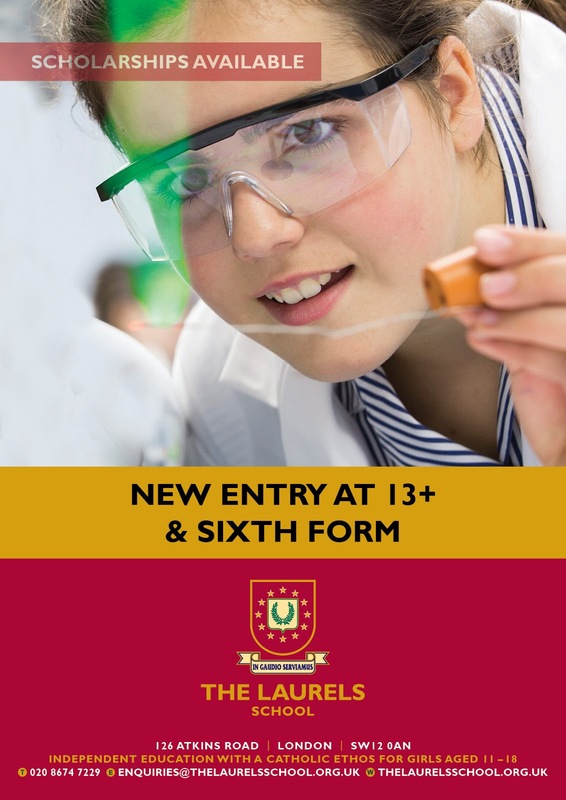 The new entry points are in response to the interest we’ve seen from prospective families with girls in these year groups and in our need to move to double-form entry in the near future. Music, Art and Academic Scholarships are available. Please feel free to phone us at 0208 674 7229 for further information or visit www.thelaurelsschool.org.uk to download an application form. 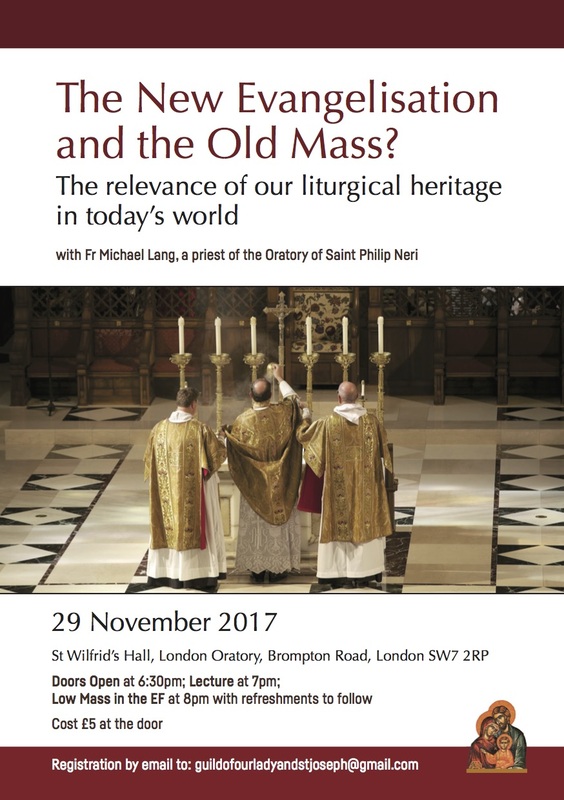 The New Evangelisation & The Old Mass? : The Guild of Our Lady & Saint Joseph invite you to join them as we deepen our understanding of the riches of our liturgical heritage and its relevance today. Father Uwe Michael Lang, a priest of the Oratory of St. Philip Neri to help us explore the inexhaustible mystery of the Eucharist. 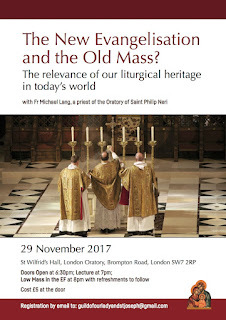 Thursday 29 Nov, St Wilfrid's Hall, London Oratory, Brompton Road. Doors open 6:30 pm and the lecture will begin at 7 pm. A low Mass in the Extra-Ordinary Form will be celebrated at 8pm. Refreshments will follow. Admission: £5 at the door.